The temperatures dropped hard today, the wind was blowing, and the western suburbs saw the first snows of the season today. I was fortunate enough to get out this morning while it was still sunny and relatively warm and get some shooting time in. The thick blanket of leaves in some areas made for a seasonally appropriate subject. 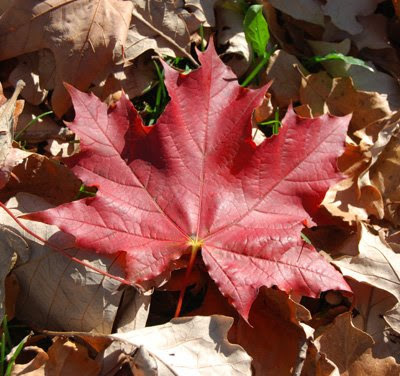 We haven't seen a lot of reds this year, so this maple leaf certainly stood out in the crowd of browns and yellows. It is almost amazing how close your photo is to the one Chuck in Seattle posted today.